Elks National Foundation :: "All I needed was a month." "All I needed was a month." While Felicia was in her doctor’s waiting room at a VA Medical Center in the Chicago area, she picked up a brochure about veterans’ assistance. She didn’t know then, but that brochure held the answer to a question she’d been asking herself for a while—how was she going to pay her rent when she was down to her last dollar? “It was heaven sent,” Felicia says. She called her HUD-VASH social director who then directed her to the Elks’ Emergency Assistance Fund, a program that allows veterans to apply for up to $2,500 of assistance if they live in one of the eight metropolitan areas targeted by the V.A. for increased focus by the Elks: Chicago, D.C., Loma Linda, Los Angeles, Miami-Dade, New York, San Diego, and Seattle. Felicia’s application for emergency assistance was approved, and her question was answered: she’d be keeping her home because the Elks were there at the right place and right time. 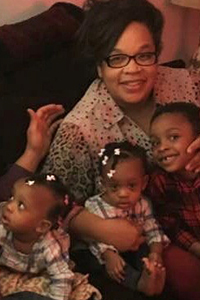 Even living with her daughter wasn’t a sure thing since her daughter has four kids of her own. If she was unable to live with her, Felicia says she’s not sure when she would’ve secured another apartment for herself. The uncertainty in Felicia’s life began when the call center that she’d worked at for five years closed. 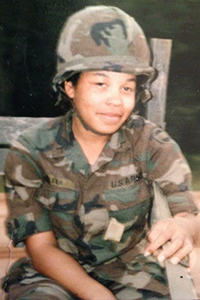 Three decades after serving six years in the Army at bases as close to home as Fort Campbell, Kentucky and as far as Anchorage, Alaska, Felicia found herself unemployed, taking small jobs just to make ends meet. The Elks helped Felicia recover. The emergency assistance helped pay her rent, she secured a job at a Navy base, and has “been great ever since.” Now, she’s focused on her new job and what’s next. She plans to finish her final semester of classes to receive her bachelor’s degree in social work. Then, she hopes to work for a nonprofit health agency. In the smaller picture, Felicia wants to get married, but it’s not exactly a priority for her. Her degree comes first, then marriage. Felicia says she’s been patient all her life, but she has a feeling this is the year for her. In part, thanks to the Emergency Assistance Fund. She hopes to support the fund herself one day. Read more stories from the Be the Spark series about other veterans who've received assistance through the Emergency Assistance Fund here. Since July 2015, the Elks National Foundation has contributed $4 million to help end veteran homelessness. The money funds the Elks National Veterans Service Commission's Welcome Home initiative, which includes an Emergency Assistance Fund for veterans in eight metropolitan areas targeted by the V.A. for increased focus by the Elks. To date, the Elks have helped more than 1,350 veterans exit or avoid homelessness through emergency assistance. Learn more at enf.elks.org/WelcomeHome.